What's Brewing is a magazine about the craft beer movement in BC, Canada. It features great original beer writing from front to back. It also features craft beer community contributions and spotlight some of the best recent articles by BC beer bloggers and authors in order to help bring attention to the craft beer movement as well as the writing talent that exists in BC and Western Canada. Ah, the angels are calling you to join them in a glass of perfectly fluffy, foamy světlý ležák, which is to say, Czech light lager. It is so fragile to transport that to fully appreciate it, you have to visit the former Bohemia to taste it fresh. If the lager is from the main brewery in the town of Plzeň, (a town the Germans call”Pilsen”), then it’s in the original (“Urquell”) style created in 1842 by Josef Groll, bittered with the famous hops of Žatec (aka “Saaz”). All drinks called Pilsener or Pilsner are named in direct or indirect homage. Pilsners came to dominate the world of beer due to their light but rich gold color, full-bodied maltiness yet a distinct bitterness from generous Saaz hopping, generally 30 IBU or more. German varieties, often spelled Pilsener, might be lighter in body and semi-sweet to off-dry. Accept no substitutes. The location Five Roads occupies at #1-6263 202 Street was originally planned as the home of Metal Edge Brewing, which was slated to open in 2018. After years in planning, that project eventually ground to a halt, and Five Roads stepped into its place, led by owner Aaron Fourt and General Manager/Brewmaster Patrick Moore. As mentioned in the cover story for the current issue of our magazine, as well as in other recent media coverage including BC Ale Trail, Langley is on the cusp of becoming the hub of the Fraser Valley’s craft beer scene. 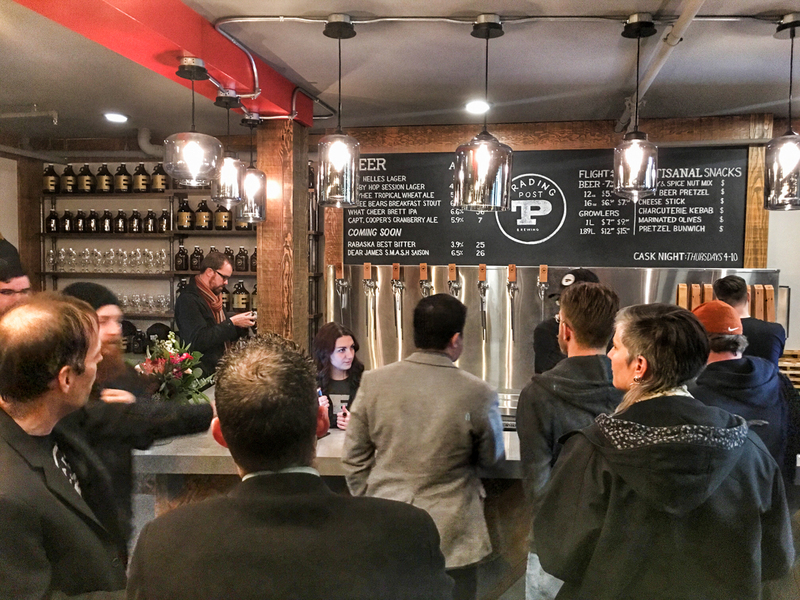 Set to have at least six breweries by 2020, the City and Township will become a brewery crawler’s draw in the same manner as East Vancouver’s ‘Yeast Van’ and ‘Brewery Creek’ neighbourhoods, Port Moody’s ‘Brewers Row’, and North Vancouver’s planned ‘Shipyards Brewery District’. Set to join Trading Post and Five Roads in 2019 is Camp Beer Co., which will be within walking distance of the two other breweries. Also not far away will be Farm Country Brewing in the City of Langley core. 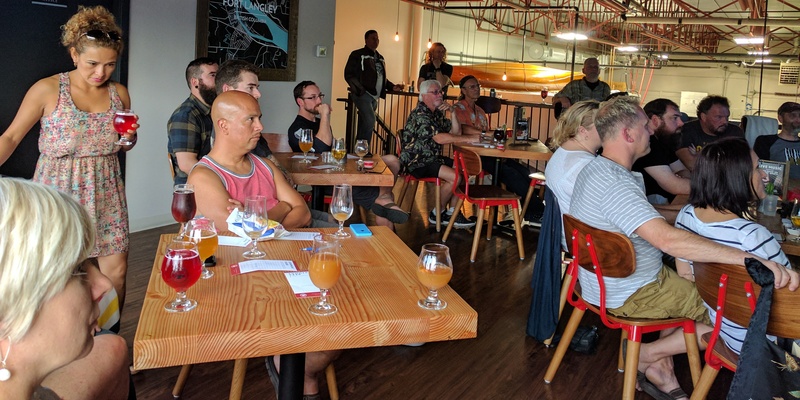 If and when the anticipated Skytrain line extention to Langley is built, beer lovers will be able to ride out for a brew tour on foot or via short cab rides. Langley is also home to Dead Frog Brewery, who moved from Aldergrove to a location not far from the future home of Smugglers’ Trail CaskWorks. There is also at least one other well-known BC brewery in discussions with the Township of Langley regarding opening a second outlet in the district. What’s Brewing snapped a few photos of the proceedings, seen here. At Horseshoe Bay, a 20-minute drive from downtown Vancouver, you board a ferry for the 95-minute crossing to Nanaimo’s Departure Bay, where our adventure begins. The full tour took us a total of 11 days, but it can easily be tackled in 2 or 3 separate parts to truly savour the craft breweries, cideries, distilleries, wineries, great food and lodging, and unforgettable scenic vistas. From the ferry, we drive 35 minutes north on Highway 19 to Parksville where our tour begins with two nights at Tigh Na Mara Seaside Spa Resort. Our spacious suite overlooked the expansive beaches next to Rathtrevor Provincial Park. To get our heads in the right space, we immediately head north to Qualicum for a forest-bathing tour with guides Rhonda and Gary Murdock. Surrounded by old-growth forest, you are taught how to be aware of all the elements in the forest, from the movement of air, the smells, sounds, and light. Our host serves us a delicious forest tea at the end of the 90-minute experience. 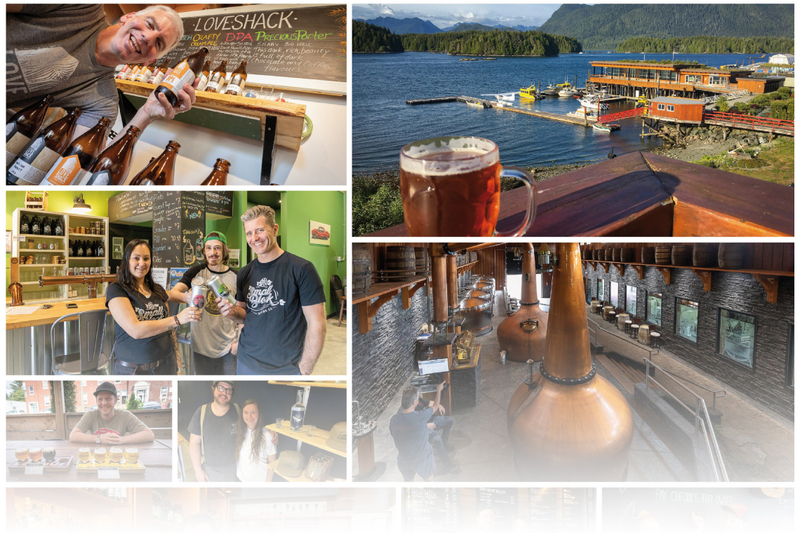 Ten minutes away is the smallest brewery on Vancouver Island: the award-winning Love Shack Libations, situated on Highway 19A in Qualicum Beach. Brewer Dave Paul is a one-man-show at this one-of-a-kind nano brewery. When not at his kettles working his craft, he’ll invite you into his tasting room/brewery. He has no need to market his beer outside of the brewery; his dedicated followers wait eagerly to buy up everything he produces. We taste award-winning pils, ales, porters and IPAs and then head back to the resort to have dinner at Cedars. The food is delicious and a good selection of local craft beers are on tap. A nightcap under the stars on the balcony, with a lullaby of waves caressing the shore, finishes off Day 1 perfectly. We start getting into island mode, with a mid-morning appointment at the lush Grotto Spa for pool bathing and a relaxing massage. We visit Milner Gardens and Woodland, north of Parksville. Queen Elizabeth and Prince Philip once stayed at this colourful seaside rhododendron estate. Be sure to partake in English afternoon tea! We arrive back to the resort just in time for a relaxing hour in the spa mineral pool and all-you-can-eat gourmet Endless Tapas Experience, dressed in bathrobes. After an early rise to catch the sunrise at low tide on the long beach, I take off my shoes and walk through the cool shallow tidal pools. Baby crabs run for cover everywhere. After breakfast, we’re off to visit Mount Arrowsmith Brewing. There is massive expansion going on. A whole new section of the brewery is being installed, to almost double its size, and a new kitchen and dining area is being prepped. Head brewer Dave Woodward is beaming. The two-year-old award-winning brewery is doing very well. From Parksville we take the coastal highway 19A through small villages along the beautiful seashore to Royston. The third and fourth nights’ stay is at the recently renovated Kingfisher Lodge. Beautiful spacious suites overlook Comox Harbour and the Strait of Georgia. Bald eagles and great blue herons fish off the rocks in front of us. Our dinner at Ocean 7 Restaurant is spectacular. We start off with a beer cocktail and then enjoy wonderful craft beers to complement our gourmet dinner. The restaurant manager, chef, and bartender all check with us to make sure the experience is topnotch. …begins with a walk on the beach to get closer to the dozen or so bald eagles sitting at tidal pools waiting for breakfast. Then at 10 a.m., we meet Gaetane for a 6-hour Gourmet Tour of the Comox Valley. We visit Clever Crow Sea Salt craft store, the amazing Shelter Point Distillery, then Cumberland Brewing for lunch and a double flight of all their premium beers. From there we visit Dark Side Chocolates for dessert. Back on the road, we stop in at Beaufort Vineyard and finally Wayward Distillery, where honey is the base of the spirits. The cocktails are fragrant and delicious! We return to the resort just in time for a Pacific Mist Spa Hydropath treatment before dinner. The paradise element is in full swing now! …begins in Courtenay at the Comox Valley Farmers’ Market, where everything looks fresh and appetizing, and the savoury and sweet baked goods are out of this world! George, the proprietor of Raven’s Moon Craft Cider, is there with a selection of his 10 craft ciders. After a tasting of his delicious products, a few more bottles get added to the stash in the back of the SUV. Before we drive south, we stop at Gladstone Brewery in Courtenay. Built in a historic mechanic’s garage, Gladstone opened its doors in 2015. Owner/head brewer Daniel Sharratt takes us through a two-flight taster selection of his award-winning beers. We leave with a good stock of ales and IPAs for the days ahead. Taking Island Highway 19 south, we arrive in Ladysmith in 2 hours. From here we take the seaside drive on Highway 1A to Chemainus. A deep blue sky and a fresh sea breeze make it a very enjoyable drive along the rustic shoreline. We arrive in the early afternoon at Riot Brewing. My long-time friends Aly and Ralf have had lots of awards in the past few years, and by chance, this would be another award day for them. Live from Halifax, Nova Scotia, the Canadian Beer Awards announce the winner and all of us scream in excitement for Aly and Ralf. Across the parking lot, the Sawmill Taphouse and Grill specializes in delicious pizzas, spicy wings, and a menu of other delectable delights. The manager has a complaint about Riot—they can’t keep their award-winning beers in stock on their tap line. Back to the brewery to say our goodbyes and stock up before returning to Ladysmith to stay the night at the recently opened Microtel Inn on the Island Highway. …is busy, starting with a scenic drive along Highway 1A through rolling pastures to Maple Bay and then heading inland to Duncan. Lunch is on the rooftop patio at the Craig Street Brew Pub; great appies and very decent beer made on-site. Right after, we head to Small Block Brewing: very small, but delicious beer with great branding. From there, it is a short hop south to Red Arrow Brewing, on the site previously occupied by the Arrow Custom Motorcycle Shop. We have a wonderful tour with Brewer Chris Gress, pick up a few bottles of IPA, and then dash south on the highway to Cobble Hill. Winding country roads take you into the rolling hills to the famous Merridale Cidery. Owners Janet and Rick are waiting with a wonderful charcuterie plate, cider cocktails, and tasters of all their ciders. This is the final destination for Day 6. After a familiarisation tour, Rick takes us to the on-site distillery—apparently the first Provincially-Certified Craft Distillery in B.C.—where we are treated to some very special vodkas and gins. Later, we have a delicious picnic dinner at our yurt. It is a chilly, breezy night, but the gas fireplace in our deluxe oasis keeps us nice and warm. The next morning Janet meets us for a five-star breakfast from their kitchen—perfect for the long day of travel ahead. We cross over from the east coast to the west coast of Vancouver Island. From Cobble Hill, it is a beautiful 4.5-hour drive past Duncan, Nanaimo, Parksville, and Port Alberni. There is a little rain in Cathedral Grove, where we walk among the towering centuries-old giant Douglas Firs. Another 90 minutes from Port Alberni takes us to the T-junction with the Pacific Rim highway. Turning right takes you towards Tofino through Pacific Rim National Park Reserve (PRNPR). If you wish to stop in the park, you must purchase a National Parks pass (good at all National Parks in Canada). Our destination is Long Beach Lodge & Resort on the edge of Cox Bay, for a three-night stay. We arrive in time to partake in the “Beer Heaven Program” at the Great Room Bar, where beverage manager André has a number of artisanal craft beers lined up for the happy-hour tasting. They stock over 99 selections! After many tastings (17) and some crispy polenta bites and mussels and clams, it’s time to head out to enjoy a dramatic blood orange sunset mirrored perfectly on the glossy wet sand beach. It begins with another perfect blue sky. After a light breakfast and a wander around Tofino, it’s time to head to Tofino Brewing for a tasting. Lunch is from Picnic Charcuterie, across the street. The afternoon is spent exploring PRNPR. Be sure to visit the Kwisitis Visitor Centre at Wickaninnish Beach. There is so much to explore, including the Rainforest Trails and Schooner Cove. A few hours later, we return to Tofino for dinner at Tuff City Sushi. It has quite a reputation for good food and drama. Get there early enough to be sure to get a table out on the back patio, where you are treated to an expansive view of Tofino Harbour, Meares Island, and Clayoquot Sound. Local craft beer is served there. Ucluelet is at the south end of Highway 4, a short 35-minute drive from the hotel. Right in the middle of the town, a former church is transforming into a brewery/pub. Still under construction at the time of our visit, it will be a welcome addition to the craft breweries of BC. Just down the hill at the harbour is the Aquarium. Everything in it is fresh from the surrounding waters of Barkley Sound. Once a year, the complete contents of the aquarium are returned to the sea. Make sure to set aside a couple of hours to walk the Wild Pacific Trail, south of Ucluelet, for incredible vistas of the wild open Pacific Ocean meeting the jagged shipwrecking rocks of the peninsula. Back in town, be sure to visit Pacific Rim Distilling. Luke, the proprietor, will tell you about the original family recipes that have made this an award-winning establishment of vodka and gin. We’re back on the highway heading east to Port Alberni, home of Twin City Brewing. Brewmaster Aaron Colyn greats us at the door for a tour of the first craft brewery in Port Alberni. At the BC Beer Awards, this new kid on the block won four awards, including Best in Show. Their pizzas are second to none. Also on the menu are spicy Thai lettuce wraps and smoked meat sandwiches. In 2019, Dog Mountain Brewing will be opening in the historic section of town. I have tasted their beers and they are very good! It seems Port Alberni is heading towards being a craft beer destination of its own! We travel back to Nanaimo to return to Vancouver. It has been quite a tour, full of beautiful vistas, friendly people, amazing resorts and hotels and libations of every kind. The craft beer list of breweries continues to rapidly expand on The Island, like the rest of the province. Sunny days are here to stay, just a ferry ride away. Our SUV returns to Vancouver laden with the liquid riches of Paradise. A decade ago, a food truck pulled up in a Tofino parking lot and started slinging Baja-influenced cuisine with Canadian West Coast flair. Ten years later, Tacofino is an established brand with real brick-and-mortar locations in addition to its fleet of trucks. Tacofino’s iconic menu is served with many types of beverages in its many locations, but at its Hastings Commissary outlet there are eight taps of BC craft beer for the ultimate pairing experience. Now they’ve taken the marriage of beer and tacos one step further with a series of beer pairing dinners, monthly from March to July 2019. To kick things off in the most appropriate fashion, the March event featured a tap takeover by Tofino Brewing Company, naturally Tacofino’s oldest beer friend. Back in the day, there was just a taco truck and a beer growler dispenser station in a windy back lot. Both companies are flourishing today! Conveniently situated on the Adanac bike route in the heart of Yeast Van, between Commercial and Clark Drive. The tasting room features 15 taps, of which an average of 10-12 different beers are pouring. The system also includes 3 nitro taps, where they serve beers that are rarely available on tap outside the tasting room. At Off the Rail Brewing Co., we love making craft beers almost as much as we enjoy drinking them. My thirst for unique beer just grew from there. In the early ‘80s, my family opened a live music bar called The Railway Club where I introduced some of my favorite craft beers to customers. As craft beer became more popular in the 1990’s, the selection was expanded to support the growing local craft breweries. ‘The Rail’ as it came to be known, soon carried one of the largest selections of local craft draught beer in Vancouver. Let’s get to know a little more about the founder of Off the Rail! Is there any better business practice that you looked for in suppliers when you ran The Railway Club that you incorporated in your business plan for Off the Rail and have found to pay off? Relationships in any business are a key component in determining partners to work with. We have some very good, understanding suppliers that we continue to work with and support. In 2018, you won Bronze at the Canadian Brewing Awards for both your Classic Pale Ale and your Crazy Train IPA. Anything those two beers have in common that might have contributed to that success? The Classic Pale has medaled 3 successive years at the Canadian Brewing Awards, and along with Crazy Train (2 successive years) is a mainline staple that does well year-round. They are both ‘British style’ beers that incorporate English barley and flavour profiles. What’s new on the horizon in terms of seasonals or new beers? We are excited to have just packaged and released our Psycle Path lager in 6-pack can format, and our Pilsner in a new-look 473 ml tall can. New releases coming soon are the Pedal Pusher Radler in 6 pack cans and the Cow Tipper milkshake IPA in 650 ml bomber format. Any new or planned collaborations? A collab with our neighbors to the East (Bomber) is still talked about, and we have another opportunity, but no definitive dates or beer styles. Any particular ways you have been active in the local community recently? Being able to help out Spirit of the West’s John Mann with some of the proceeds of the Spirit Lifter pilsner has been a highlight for the brewery. Any other topic you’d care to highlight? Our people…we have a great dedicated team in all areas of the brewery operations! 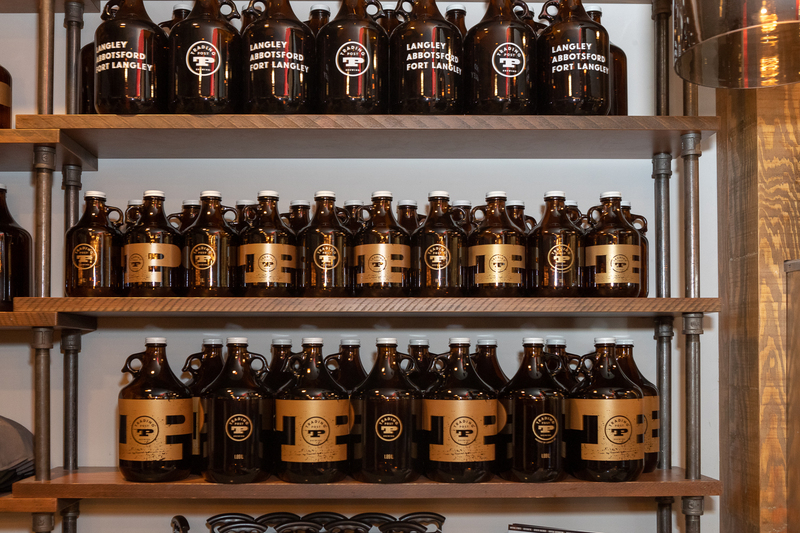 Located in the heart of East Vancouver, our brewery features a cozy and bright tasting room where customers can enjoy our hand-crafted beers, fill growlers, and purchase packaged beer. The tasting room features 15 taps, of which an average of 10-12 different beers are pouring – all brewed on site! The system also includes 3 nitro taps, where we serve beers that are rarely available on tap outside the tasting room. We serve flights of four 4 oz tasters, individual 6 0z tasters, 12 oz glasses, and 20 oz pints. Touring Yeast Van? We are proudly located on the Adanac bike path, which is well known as one of the major cycling “highways” in the city. Hungry? While we do not operate a kitchen, we serve delicious snacks from East Side Beer Food that are delivered fresh daily. Off the Rail Brewing is equipped with a 2000 L brewhouse and both 4000 L and 2000 L fermentation tanks. We will be adding two 6000 L fermentation tanks that will be dedicated Pilsner and Lager vessels in the upcoming months. Our 4000 L tanks are home to our ‘main line’ beers with the 2000 L tanks normally reserved for seasonal brews. Many of our tasting room beers are done in a 45 L test batch system and are only available until the next batch is complete. Some make their way to a 2000 L batch of 650 mL bottles. My love for traditional English ales, German lagers, and US IPAs make up the majority of what we brew… along with a few other gems that we put into our tasting room rotation. This Easter Sunday, between the chocolate eggs for breakfast and carving the ham for dinner, you might want to slip out of the house for the afternoon. That’s because Central City Brewing’s Red Racer Taphouse is throwing their most compelling Easter Cask Festival yet. The Easter Cask Fest debuted two years ago and has become an annual tradition. In terms of value for money, this round offers the best deal so far. Tickets are only $25, which is the lowest price to date. Entry comes with 10 complimentary tokens, which is the most ever. (Many beer festivals cost more to enter, and give you no tokens.) If you’re the type of person who cares about value, simple math dictates that you should make this your Easter plan. Note also that partial proceeds from the event will benefit The Hutch Fund, a not-for-profit organization founded in North Vancouver working towards fundraising money for the mental health community. The brewery list is yet to be released, but suffice to say there’ll be some special casks with an Easter theme. There are plans for 20 different casks in all, from all over BC. Also, you don’t have to worry that this is one of those beer festivals where you’ll leave starving, with your feet sore from standing for hours. That’s because the event’s home is a nice, comfy pub with a full menu, and on Easter Sunday they’ll have food specials all day long, specially selected to pair with beer. 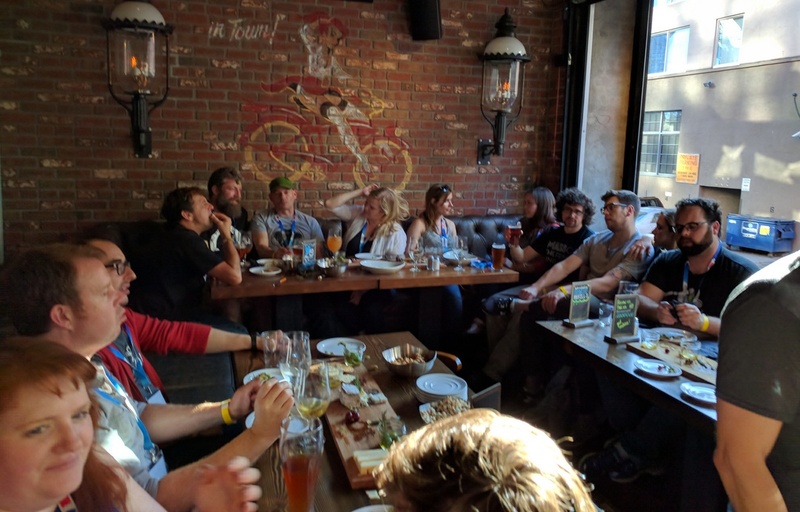 Vancouver cask meetups originated around 15 years ago in the same Beatty Street location that this Easter’s event will be held in, back when it was the home of Dix BBQ & Brewery. CAMRA Vancouver, who often held meetings at that location, showed leadership in developing the template for a series of events dubbed ‘Caskival’. Eventually the Dix Caskivals died along with the brewery itself. The next Lower Mainland organization to step up and create an ongoing cask festival series was Central City Brewing, who were hosting a top-notch event at their Surrey brewpub location by 2008. Over the years, countless great memories have been made at Central City’s Summer and Winter extravaganzas. The people involved in organizing the event have always been amazing hosts, taking good care of the patrons and the brewers attending. As fate would have it, Central City eventually took over the old Dix Beatty Street location, bringing Vancouver’s cask festival history full circle. Now you get to be part of Vancouver’s oldest cask festival tradition. There is no doubt the craft beer movement is sweeping the world. Industry statistics worldwide show the number of craft breweries increasing year over year. It’s exciting to watch, but is this growth sustainable? What was an emerging industry is now a growth industry, and the “if we brew it they will come” strategy is longer an option. Macro breweries are no longer the common enemy; the battle is now among local brands. So how does a small bootstrapping brewery compete against the ones with deep pockets? The answer is to build community. Every successful brand has one. Building a community is the single most powerful defence against shift in the industry. If the Hazy IPA trend crashes tomorrow, a strong and loyal community will still be there to support a brewery, because they care. It’s easy to see which breweries are already working at it and which aren’t. Those that have it sell out of special releases in a day (if not hours), their casks are done before many folks finish their workday, and the beer—regardless how good or bad it is—is posted as the “best in town”. People crave becoming part of this thing even if they don’t know what it is. Fans of a brewery dress in their branded clothing, advocate for their beer, and frequent the tasting room. The breweries that aren’t working at it brew beers and sell them. Their customers like the product enough to buy them once and take them home to drink on the couch with their ugly cat. Numerous studies back up the connection between community and increased sales. Approximately 80% of customers consider themselves “loyal” after three to five purchases. And even a 5% increase in customer retention can boost sales anywhere from 25% to 95%. No matter what the motivation, building community is worth the investment. People like to be part of something that stands for something. When a brewery’s values and standards are loud and clear, even written on the wall, people can easily decide whether to take part. A brewery that builds a reputation for putting community first, making ethical decisions, and providing results that align with their core values makes it easy for the community to advocate for them. Humans are creatures of habit and find comfort in things being the same as they were the last time. Consistent messaging and reliable core beers win more supporters than shifting values and priorities and IPA that tastes different every time. It has never been easier to learn the desires and frustrations of a given group of people. A five-minute search on social media provides invaluable feedback about where a community stands. Paying attention to the customer base’s wants and needs makes it easier and more cost effective for the brewery to engage with that base. Making great beer is no longer the only—or a guaranteed—route to success. To fight purely on marketing budgets alone will leave more breweries bankrupt than successful. The most effective tool any brewery can arm themselves with is a strong community to have their back through good times and bad. Those that spend the time now investing in their community will have a fighting chance to still be standing when the dust settles. Picture: Coming soon – Liam Peyton, co-founder of Hatchery Brewing, announces the upcoming opening of Penticton’s newest brewery. Okanagan Fest of Ale is the start of the tourism season. This year, a record number of craft breweries will flock to Penticton to celebrating the 24th Annual Okanagan Fest of Ale with craft beer lovers on April 12 and 13. Seventy craft breweries and cideries will serve up a selection of over 200 craft beers, cask ales, and artisanal ciders. Fifteen of them are new to the event, so even if you’ve been before, you have even more reasons to come again. In addition to great craft beer and cider, look for some delicious eats from local restaurateurs, including craft-inspired twists on their dishes, a brewing education station, photo booth, on-site liquor store, and live entertainment both indoors and out. Visit the Okanagan Fest of Ale website for some sip-and-stay getaways. Plan to spend a few days here, because there are lots of other craft-beer-themed events in town that week. “Every Beer Has a Story” according to Joe Wiebe, the Thirsty Writer, who will share stories and samples of some of his favourite BC beers at Bad Tattoo Brewing on April 11, followed by the annual Strange Brews event at Craft Corner Kitchen. Also, on the same date, Highway 97 Brewing is hosting their First Annual Fest of Ale Brewers Tailgate Party in their parking lot with live music, cask beer and food. 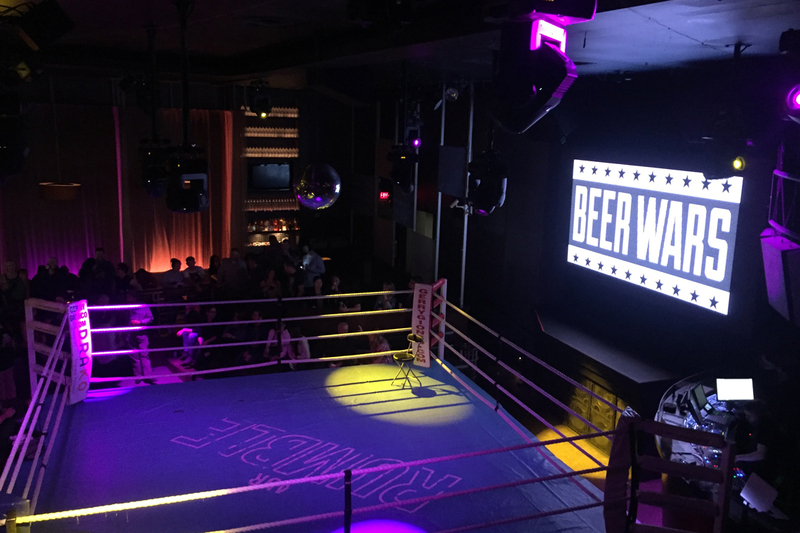 The Barley Mill Brew Pub & Sports Bistro will have beer-themed karaoke on April 12 and 13, and the annual Murderers Row Cask Event will be held at the Kettle Valley Station Pub at the Penticton Ramada on April 13. Recover from the Fest at the “Hair of the Dog” buffet brunch at the Barking Parrot Bar and extend the weekend with free live music at Cannery Brewing on Sunday, April 14. Definitely leave time in your schedule to visit our local breweries. Download the BC Ale Trail app to collect and redeem points. Be sure to also pick up a Penticton Ale Trail passport and get it stamped as you visit the breweries, then enter your completed passport into a draw to win a quarterly prize package. In new-beer news, the folks at Bad Tattoo Brewing are launching their new Variety Pack in March. This eight-pack of 473 ml tall cans includes three of their Flagship beers, Los Muertos Cerveza Negra, Vagabond Pilsner, and Tramp Stamp Pale Ale. Then, each season they will rotate in a Brewer’s Choice, beginning with the return of Bike Barn ISA. Highway 97 Brewing is launching three new beers this spring and summer. Bad Gas Travels Real Fast is their first sour. All Canadian ESB highlights the national love of maple syrup and back bacon. And Provincial Park Pale Ale is a New England style Simcoe hop–inspired pale ale. Watch for all three new beers in 473 ml cans from the brewery and select stores, and on tap at select pubs and restaurants. Over at Cannery Brewing, watch for the release of Ceres, a fundraiser beer where partial proceeds support the Pink Boots Society. The women of Cannery Brewing named this Hazy ISA after the Roman goddess of agriculture, grain crops, fertility, and motherly relationships. This limited release will launch on March 8, International Women’s Day, in four-packs of 473 ml tall cans and on draft. We’re all stoked here in Penticton for the opening of two new breweries downtown. Renovations are well underway at Hatchery Brewing, which will open in early summer with a two-story, 250-seat tasting room and lounge plus a rooftop patio bar with a killer view. Just a short walk away, toward Bad Tattoo, is the new home of Neighbourhood Brewing. They have an impressive pedigree; this brewery was created by the same founders as Yellow Dog Brewing and some new friends. Demolition of the buildings on the property has been completed, and construction of the new brewery is expected to begin shortly. It’s looking like a late summer or early fall opening for Neighbourhood. On your way to or from Penticton, plan a stop at Firehall Brewery in Oliver and try their new Coffee Blond Ale, a collaboration ale brewed with Oliver’s Wolf Tree Coffee Company. Then hop onto their social media and enter the contest to help name this collab. Keep an eye out for it in bombers as well. One last thing: now is the time to register for the third Annual Penticton Beer Run coming up on June 8. Walk, run, or crawl this 10K fun run, which showcases some amazing Okanagan views and multiple beer stops along the way. I’ll see you at the finish line with a cold craft beer in hand. Until then, cheers. 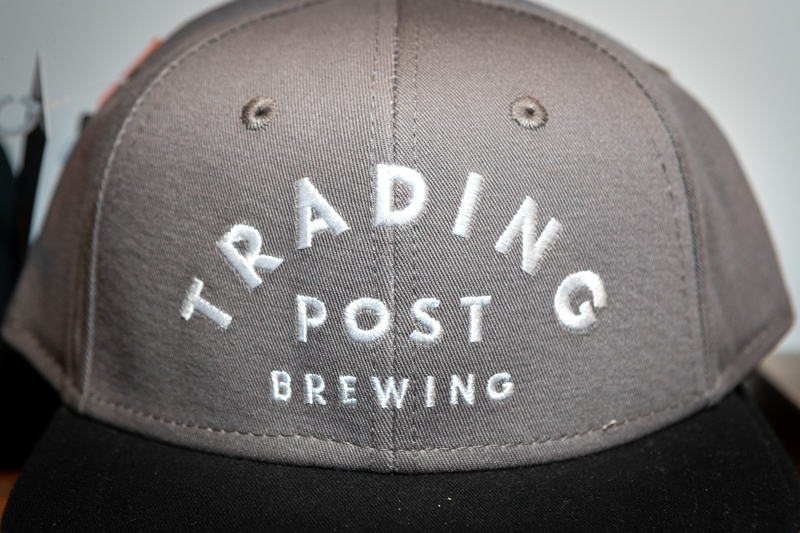 Trading Post Brewing Co. might be flying under the radar for some BC beer fans, but it’s become a hub for the burgeoning Fraser Valley beer scene. Their third anniversary party in early February 2019 bore testament to that, as members of a handful of Valley ‘brewcomers’ including Northpaw Brewing, Fraser Mills Fermentation, Smuggler’s Trail, Farm Country, Five Roads, Camp Brewing and its point of origin, the Full Barrel Brew Club filed in to pay homage to what, by contrast, feels like a veteran brewery after only three years. 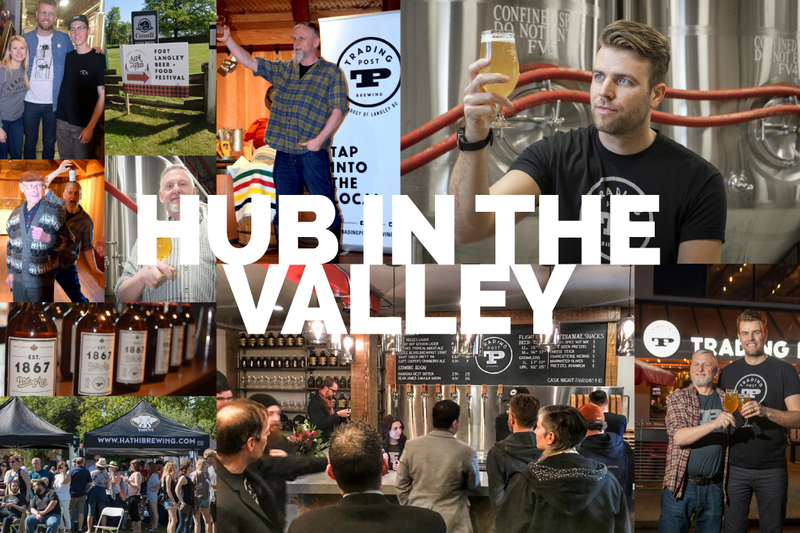 TP is well positioned, right at the centre of what promises to become South Fraser’s answer to Port Moody—with neighbouring breweries imminent, a Skytrain extension in planning and Langley itself blowing up. Mind you, “Trading Post” isn’t just a brewery; it’s a hub in another sense. It’s the brand name at the core of a growing number of initiatives undertaken by Fort Langley’s Verhoeff family based around brewing, hospitality and events in the latter half of this decade. These include a respected brewery, two (so far) brewery-supplied “Eateries,” partnerships with two pro sports teams and a famous restaurateur, as well as a large annual beer festival which, in turn, spawned a spanking new events production company. The history of modern brewing includes numerous stories of families creating small businesses with varying levels of success. Langley’s Trading Post is quietly one of the best examples you’ll find in BC. That alone is enough for a compelling narrative, but our story isn’t just about success in business for the benefit of one family. It’s about the contributions that family is making to their community in the process, and the determination it has taken to make that happen. The odd thing about the first meeting of Lance’s Dutch progenitors, born within a year of each other, is where it happened. Decades ago, but also within a year of each other, the families of both father Paul and mother Cobi independently emigrated to the same city in Canada. Inevitably, these families connected, which led to Paul and Cobi’s introduction. Overcoming a rocky first impression, the couple eventually dated and would start a family in their adopted hometown of Calgary. But that’s not the direction the elder Verhoeff’s career went, and not how he would make his money. He recalls, “I was studying business, and I knew that the hospitality industry was going to be too all-encompassing at a time when I wanted to be with my growing family. But I always loved the idea.” Instead, Paul and his brother Stephen would create two successful flooring firms and eventually found the Verhoeff Group of Companies, a collection of family enterprises. As Paul put in the work to become a successful businessman over the years, the notion of working in the food and beverage trade remained dormant, waiting for a special idea to awaken it. When Paul and Cobi’s brood of four children approached the age of higher education, the family considered two faith-based colleges in Canada before leaning toward Langley’s highly regarded Trinity Western University. A small migration to British Columbia began as Lance’s older sister Lies arrived in 1999, followed by Lance in 2006 and his brother Rudy the year after. Aside from its curriculum, the school was attractive for its advanced athletics program. With considerable height inherited from their tall father, the Verhoeff offspring were naturals at sports. Lies and Rudy would become known for their volleyball prowess, with both becoming national team members and Rudy an Olympian. As for Lance, his six-foot-nine frame would serve him well as he became a standout in basketball (he still holds the school record for most blocked shots in a single game) and a passionate TWU Spartan. In the process he became generally infatuated with his new West Coast surroundings, and particularly so with a fellow student named Marissa he was starting to see a lot of. What he did know is that he wanted to run his own business. Exactly what sort of business was an open question for a few years. During this period, Marissa was studying at UBC so the couple took up residence closer to school in Kitsilano. That’s when Lance was introduced to beer. To be accurate, Lance was only 13 years old when he was originally introduced to beer. As a youngster of Dutch heritage, he was handed a Heineken by his father at a relatively tender age, and drank what most would consider “regular beer” through college age and beyond. His craft discovery would not occur until around the fall of 2014. “My buddy called me up one night and said, ‘Hey, what are you doing this Friday? Let’s go out to the breweries.’” ‘Breweries?’, Lance thought. He recalls being completely unaware that people could make an activity of visiting the places where beer was manufactured. Of course, this was the dawn of a golden age in what had recently become known as Yeast Van. Verhoeff found himself fascinated by the experience of the tasting room and became a big fan of Mount Pleasant notables Brassneck Brewery and 33 Acres. The community aspect in these gathering places resonated with Lance’s family memories and ticked certain boxes for him. Meanwhile, parents Paul and Cobi were travelling frequently between the kids’ newly adopted BC base and their home in Calgary, until the pull of the West Coast won out and they settled in Fort Langley. Eventually Lance and Marissa ended their time in Vancouver and joined them nearby. Our brewery-struck business grad immediately noticed a void in his surroundings. “Where are the breweries in Langley?” he thought, and it was only a matter of time before the aspiring businessman set his mind to the pursuit of his first venture. 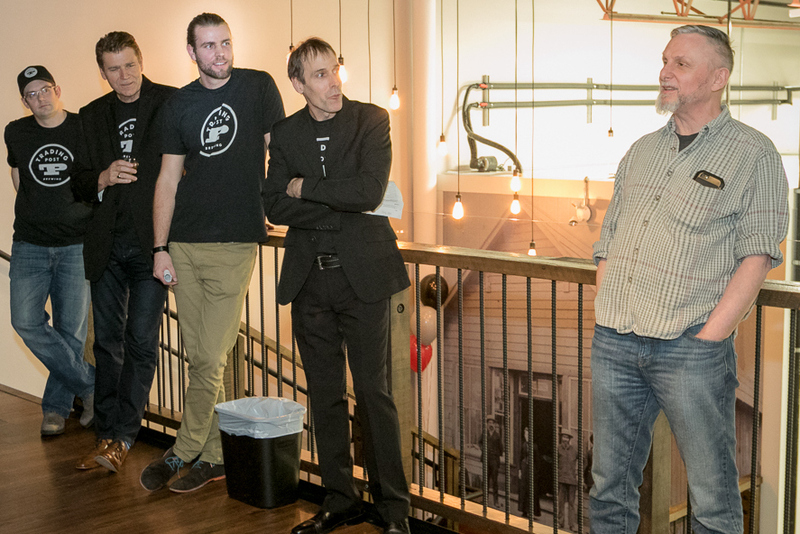 In that endeavour, Lance demonstrated a real dedication to seeking out and picking the brains of people in the famously collaborative craft brewing industry. He made it a goal to visit every brewery in the Fraser Valley and find out how they worked. That’s how he made his first critical connection in the industry. 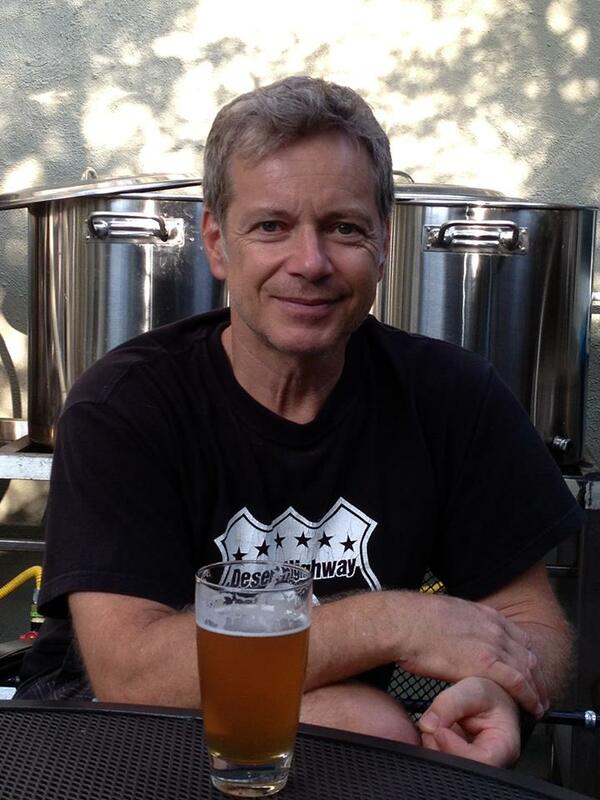 John Ohler is a hospitality and brewing industry veteran who made his name managing 1990s startup Howe Sound Brewing. By 2015 he was working with Abbotsford’s Old Abbey Ales, and that’s where he was when keen young Lance Verhoeff walked in. As the visitor sipped beers and asked question after question, they struck up a friendship. By this time, Lance had bounced the idea of a brewery business off his well-established father. The elder’s first reaction was, “Why don’t we make wine instead?” The beer bug hadn’t bitten because Paul hadn’t yet acquired the exposure to craft culture his son had, so Lance’s first business hurdle was to convince his father that a brewery was the right idea. Lance addressed this by leading his Dad and Uncle on pilgrimages of discovery to East Van and then Oregon. “Walking in to (Portland’s) Hair of the Dog and seeing their taplist… it was wild,” Lance recalls. Standing outside afterward, they met the head brewer, who took them in the brewhouse and showed them around. As it had for so many others, the call of craft beer worked its magic on the business-minded visitors. John Ohler, a chef by training, was a natural to lead the charge. Lance opines, “He was the perfect storm for us because he had the culinary background to help us open a kitchen, create a menu and pair beer with food.” He also had well-formed ideas as to how to properly open a brewery. This would be key to getting the Verhoeffs off the ground. But first they needed a brewer, and for this Ohler provided the best connection of all. Veteran Tony Dewald had been working with John to help start up Old Abbey. He lived just down the road in Langley and was receptive to the idea of reducing his commute. After a wooing period, Tony gave notice on his birthday in September 2015, and the family had their star brewmaster. They also needed a name for their brewery, and for this, Lance would turn to advice from someone closer to home. He had known for some time that the business would theme itself around celebration of “local” as well as pay tribute to Langley’s colonial heritage. “The original idea was to call it Historic Brewing,” Lance admits. Fortunately, he would do better with the help of his wife. Reading up on the background of Fort Langley, Lance picked up that it was a Hudson’s Bay trading post—which is to say, a place of gathering. This dovetailed perfectly with the vision he was trying to encapsulate. Marissa said sensibly, “Why don’t you just call it ‘Trading Post Brewing’?” Certain that the name would have been claimed, Lance Googled the name and found to his delight that it wasn’t. Beverage brand studio Dossier Creative worked their magic, and a very solid brand was established. Ohler’s experience and professionalism would shine through when opening day impressed all visitors with a great team and great presentation in February 2016. Creating a brewery in Fort Langley itself had proven to be problematic, since the village is by design isolated by the river, away from the main transportation links. But that didn’t mean the Verhoeffs had given up on owning a restaurant in their home enclave. Even while brewery planning was underway, they had their eye on a building that would be absolutely perfect for their dream outlet: a wooden edifice built in the 1980s as a replica of a pioneer-era trading post. This one wouldn’t come easy, as ownership made it clear the building wasn’t available for their brewery project. But only a week after being rejected, Lance was scouring want ads in Craigslist when he stumbled across something remarkable: there on the Web was the very same building he had just enquired about—and it was listed for sale. Lance, bearing the want ad, returned to the landlord who was obliged to divulge that the family had had a change of heart in the space of a week. This time there would be no rejecting the young businessman, and a lease agreement and option to purchase was struck. In a case of perseverance creating luck, Lance Verhoeff’s diligence was rewarded handsomely and the family had the perfect spot for what became the Trading Post Eatery. It launched later in 2016, serving beers trucked in from the brewery. That drive to turn over rocks was also how Lance found his mechanical contractor. 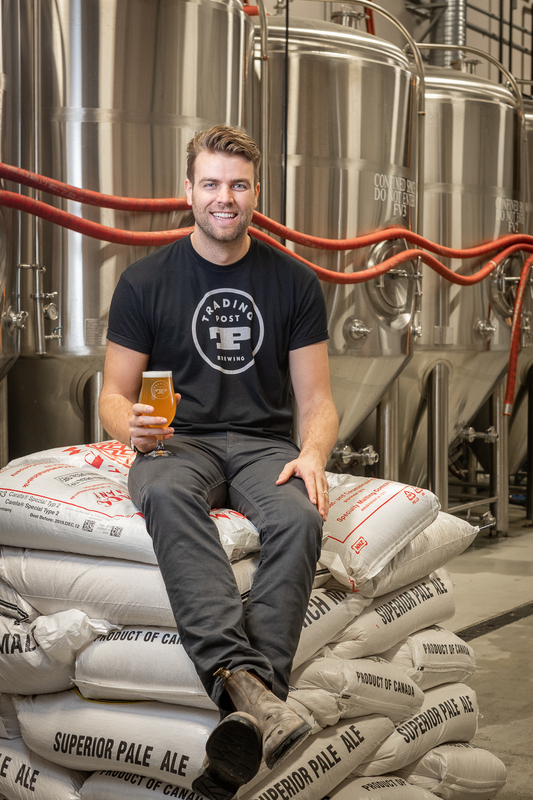 Early on in his research phase, while working as a salesman for Milwaukee Tool, he summoned up the courage to stop in at Dageraad Brewing in Burnaby. “I’ll just go talk to them,” he thought. As he stepped out of the branded truck in his branded work clothes, the first person he shook hands with was tradesman Allen Vidovic of A&D Plumbing. He listened to Lance’s plan and eventually helped build out his brewery. The layout is an “open concept” design. “I wanted people to experience the brewery—from visually seeing it, to smelling it and hearing it,” explains Verhoeff. “I was frustrated with breweries where the brewhouse is closed off and you can’t see it. You might as well be in a pub.” The end result has two levels, including a second floor mezzanine that allows visitors to watch Dewald’s brewing process like symphony-goers in their balcony seats. 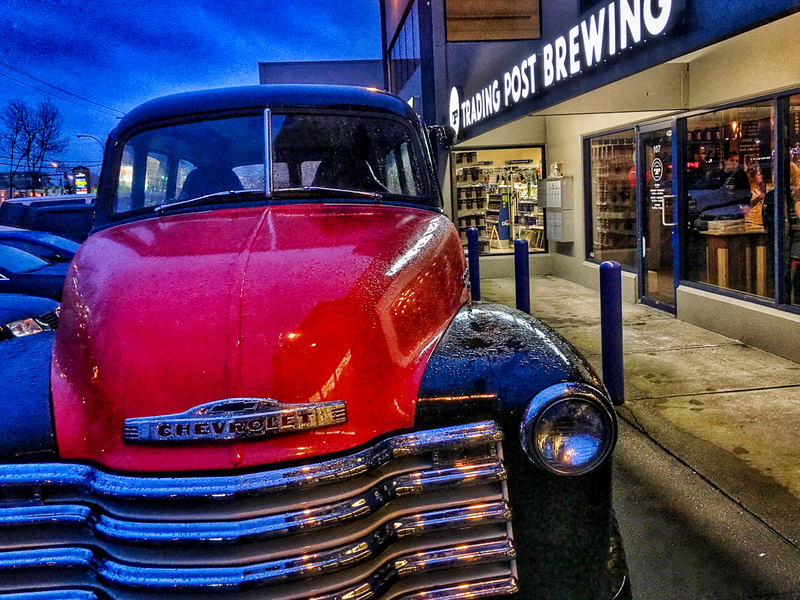 Brewer Dewald and owner Verhoeff are quite different personalities, but with Trading Post they were able to combine visions to create a brewery experience and beer list that appeals to their visitors. Right out of the gate, their taplist was a smart balance of accessible yet not predictable; for instance, instead of presenting just a “lager”, they taught the citizens of Langley what a Helles is. Instead of your standard dark beer, they went with a sharp coffee stout. For a fruit beer, they came up with a tart cranberry ale (in winter, alternating with a raspberry in summer). Each of these is still on their menu board, some sporting names that evoke Langley-area heritage themes. Their popularity is in no danger. The pair’s original stated influence was Brassneck, a brewery where there are innumerable distinctive beers that rotate throughout time. Tony says the plan was, “There might be fifty beers to draw from, but only 8 are on tap at any given moment.” But those experimental brews weren’t all hits, and Trading Post learned quickly that there’s a limit to how far into esoteric beer territory Valley residents can be led. For instance, their launch-day Brett IPA was quietly retired. “We realized that we were shooting 3 feet over people’s heads,” Dewald says somewhat ruefully. He compares it with his days as half of the famed 1980s ‘sludgeabilly’ duo Deja Voodoo. “Our hit song was something called Cheese & Crackers by Rosco Gordon. We changed the chords, changed the chord progression and changed the words.” Dewald looks at designing beers with as a similar exercise, like a jazz musician taking a musical standard and riffing on it. That includes ingredients. “You can buy different things now that weren’t available for any money not long ago,” Dewald offers, with a nod to the skid of Weyermann floor malt he’s pictured atop of on this issue’s cover. Tony lives in a rural setting with wife Andy, grows crops and identifies as a Langley farmer, but he’s realistic. “I would love to use all local ingredients, but not everything can come from here. With real German floor-malted grain, hops and yeast, and local water that is very similar to Munich’s, I think I can make something that rivals the true flavour and intensity of German beer.” As it happens, Trading Post’s Helles is their biggest seller by a wide margin. 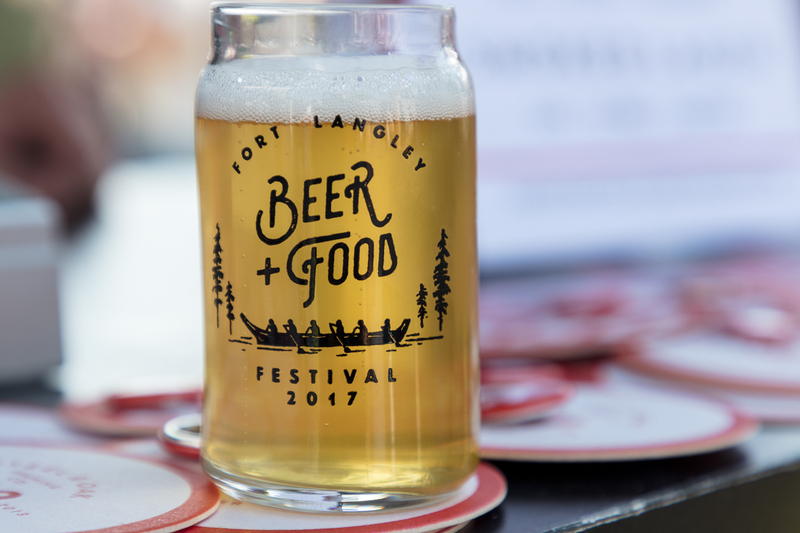 In 2017 the company broke into the events business when it kicked off the Fort Langley Beer + Food Festival, a full-blown outdoor event in partnership with the Fort Langley National Historic Site. The team hoped for 500-1000 attendees in its first year; they netted 1500. They sold double that the second year. This year, capacity was expanded to an impressive 4000 and Early Bird tickets went quickly. The events side has gone so well it’s spawned a new division of the Verhoeff Group. “We love hosting people, and we love celebrating life,” Paul shared with us. “So we’ve decided to set up a separate organization called Red Door Events.” They’re planning to present a three-day music festival called Summerset on the September long weekend at the same Fort Langley NHS site, as well as a Fort Langley Oktoberfest, a Christmas Market and another big Christmas event in Calgary. His principal accomplishment on the charitable side is the Spartan Foundation, a not-for-profit that Verhoeff founded in order to support the Spartan athletics program at Trinity Western. From an original goal to raise $100,000 per year, the events-based charity has grown to the point it raises $1M per annum for TWU. Opportunity International Canada, a cause that the family supports through their flooring businesses, and Paul is a Board member of is a charitable organization which helps people in developing countries bootstrap themselves via small business loans. It resonates for Paul because it reminds him of the faith others showed in loaning him the money to start his own first enterprise. It’s also led to another Trading Post connection. Through his work with that charity, Paul happened to meet Vikram Vij of Dragon’s Den fame. 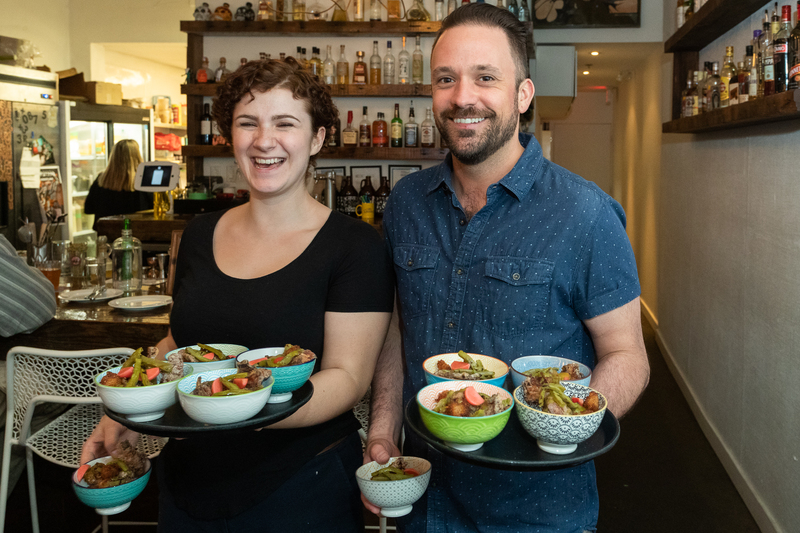 Their friendship led to the creation of Vikram’s Weissen for Vij’s My Shanti restaurant in South Surrey, as well as a shared tour of India for Opportunity International. Trading Post also sponsors an annual scholarship for a deserving student in Brewing and Brewery Operations at Langley’s Kwantlen Polytechnic University, given in the name of John Mitchell, the godfather of BC craft beer.